Writing a resume for writing can be a difficult job if you do not know how to do it or where to start. 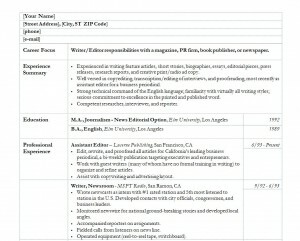 This free Writer Resume Template can be used to help you fix this problem. The template is easy to use, and can be quickly accomplished and filled out, saving you time and energy to do other things. If you follow these simple directions, you will be able to make an impressive resume to show off in order to get a job. First, write your name in at the top where it says name. Include your street address, city, and state zip code after you have done that. It also will prompt you to fill in your phone number and your email so that employers will be able to get in touch with you easier. The second step to using the writer resume template is to put the specifics of your career onto the paper. The third step is to talk about any experiences that you have had in that specific field. The fourth step is for you to fill in the resume any education that you have currently had, especially if you have graduated in that specific field. The fifth step is to fill in any professional experience that you have done in your particular field of writing. The sixth step is to fill out your computer skills and what you are able to do, such as Microsoft Word, PowerPoint, etc. Don’t be too broad with descriptions. You may miss out on getting a good job by being vague. Be honest when you create your resume! No one respects someone who lies in order to get a job that they can’t do, or who lies in the first place, for that matter. Remember to be neat and concise when composing your resume. Businesses enjoy resumes that are neatly typed, since they have to look through and evaluate a lot of people for the job.